Home improvement television shows and the internet didn’t create kitchen envy, they just made it much easier to see how big a difference a kitchen remodel can make. And let’s face it, you do get red with jealousy whenever you see a beautiful kitchen remodel on a television show. In fact, we are willing to bet that you are sitting at your kitchen table right now dreaming about how you could have a kitchen that looks much better. But then you might be sitting at your kitchen table wondering if you should remodel your kitchen. If this is you, then you are who we are trying to get through to. 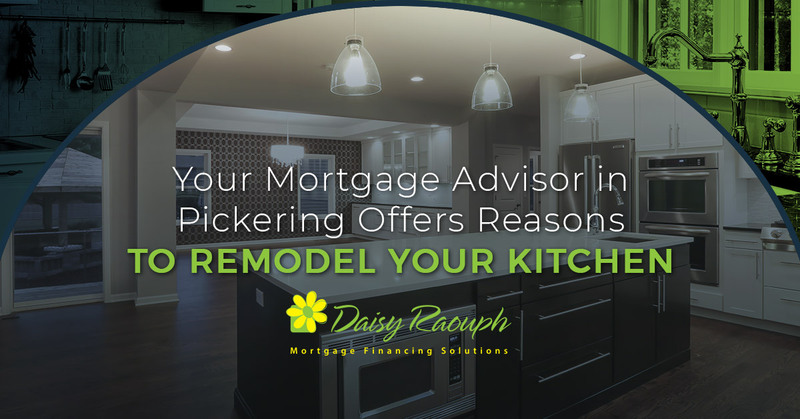 Daisy Raouph, your mortgage advisor in Pickering, offers these reasons you should consider having your kitchen remodeled. Even if you don’t hate your countertops, flooring and cabinets, they may not reflect your style or your personality. A kitchen renovation is the only way to have a kitchen that suits your taste. Your kitchen may have worked out fine for the previous owner, but it really doesn’t fit into your lifestyle. For example, you could really use a breakfast bar. The kitchen is the heart of any home, it is the place where the family gathers. So you want your kitchen to be a functional kitchen that everybody is happy about. New kitchen trends can be seen in luxury design magazines and on home improvement television shows every day. It’s kind of hard to avoid them. And even though many of you won’t fess up to it, you want to be as trendy as your friends and neighbors. By remodeling your kitchen, you can have that under-counter refrigerator that allows children to serve themselves or a kitchen island complete with built-in bar stools. It is these trends that enhance your kitchen experience. The passage of time inevitably brings about change. And with these changes come a host of new priorities. For example, your kitchen served you very well when the kids were quite young. Now that your kids have become teens, your kitchen needs to change to benefit them right now. Perhaps your kitchen was ideal when just you and your spouse lived in your house. But now that you have kids, the kitchen doesn’t function as well as you think it should. A renovation gives you the chance to create a kitchen that is perfect for your family right here, right now. A renovated, up-to-date kitchen not only sets your home apart from others, it adds to the resale value as well. Also, a newly remodeled kitchen is sure to be a hit with potential buyers. Your outdated appliances are costing you money. There is a lot of money that can be saved when you remodel your kitchen and have energy-efficient appliances installed. As you can see, there are plenty of good reasons to consider having your kitchen remodeled. If you are in need of a financial advisor to get the job done, call Daisy Raouph.